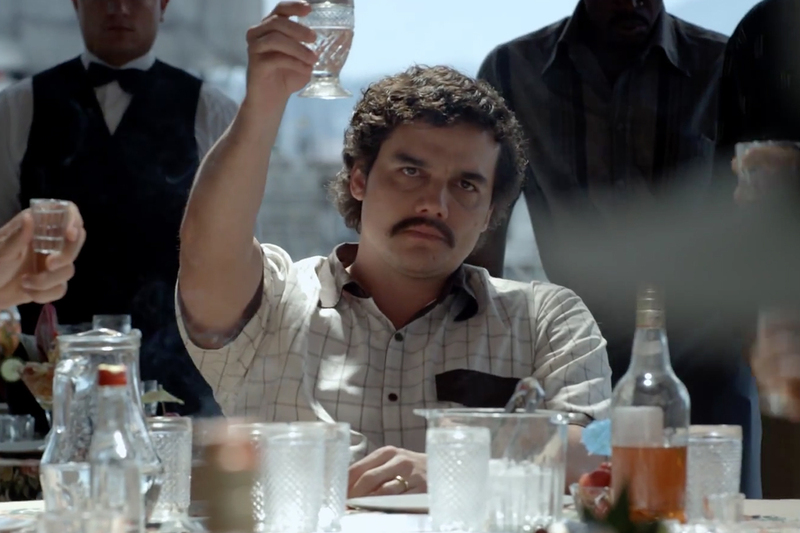 I started watching Narcos, the Netflix drama on the DEA’s war against Pablo Escobar. I’m more than halfway through and so far the show is very engaging and well-shot with a good cast (the voice-over work can be a bit much at times, however). Wagner Moura’s performance as Escobar captures a brooding mood that is very different from other portrayals of the Colombian drug titan than I’m used to seeing. However, there was something amiss as I continued watching. Sure, the translation was more than serviceable and the on-location shooting was pristine. But the total product wasn’t pure. Regular American viewers have memories of Breaking Bad and The Wire as the destination for drug-heavy TV drama. That’s not always the case for Spanish-speaking viewers. From there comes the path of narco cinema and narco corridos, movies and music glorifying the drug trade. Narco cinema has its roots firmly in the B-movie aesthetic, with its shoddy film-making and even more suspect acting. But something intriguing happened when those themes crossed the border into TV. What came is an interesting hybrid that takes the format of telenovelas and the spirit of low-rent Mexican/Colombian drug movies. Instead of 15-20 some-odd episodes, you have shows past 60. All romantic arcs of forbidden love are replaced with plots of violence, treachery and the drug lord’s lust for power. These narco-novelas are international productions with huge fanbases both in both the Americas. Narcos also has all of those ingredients, but why didn’t it appeal to me more than the narco-novela have? It’s a simple matter of creative authenticity. The best example comes from El Cartel de los Sapos, a narco-novela from a while back that set the tone for many others. Yes, the acting could be lacking at times, but the dialogue was so true to the character of the drug lords, the sicarios, and others that one can’t help but feel more engrossed in their actions. What made it standout was the source material that came from author/screenwriter Andres Lopez. He wrote the show based on his novel, inspired on his experience as a drug trafficker, and made the right adaptation to TV – something very similar to what David Simon did with his journalism experience and The Wire. But the very truth of narco novelas isn’t that they are critically acclaimed. The shows tread a very fine line between schlock and gritty realism, most of the time veering to the former. It’s popcorn entertainment at its core, but the inherent feeling of a deeper reality, even when it digs into its telenovela roots, makes it better. And the quality is increasing – Escobar, el Patron del Mal, was a 2012 sprawling drug series entailing the life of the kingpin. Like Narcos, it was made on location, but this time it was created by Colombian television, not only adding to the authenticity but the controversy in glorifying the man. Telemundo’s hit show El Señor de los Cielos has stepped up its game every season – the fact it even has seasons shows its strength, most novelas are standalone stories – and constantly evolves from its barely-autobiographical story of a high-flying drug lord to the show’s conversion of real-life drug icons into fictionalized villains, all the way to the use of the 2014 mass kidnapping of Mexican students as a plot point. So while it is exciting that Netflix made its route for audience-addicting drug television, know this – there’s been other, more established paths bringing in a product that is superior in some ways, even when they get over-the-top. Enjoy its trashiness, because within it lies a truth you may not find in the classy veneer of the other.